Ruffo's show is centered on a discussion of empire-building, of nationalism and conflict, of commerce, and of political inter-dependence. Using the flags and maps of six different national identities (China, Great Britain, Hamas, Israel, Lebanon, USA), he has made groups of drawings, watercolours, and paintings that are carefully executed and meticulously drawn. These works trace the cultural and economic influences of some of the world's most powerful countries and their impact on international relations. Ruffo also reflects on the situations of territories created almost arbitrarily on the basis of geographical maps rather than on the histories of their peoples. In the middle of the gallery will be a large installation, DAS CHINESISCHE REICH: Goods have all the rights of movement that no human being may ever have, whose title was taken from a text by the Italian writer Roberto Saviano. 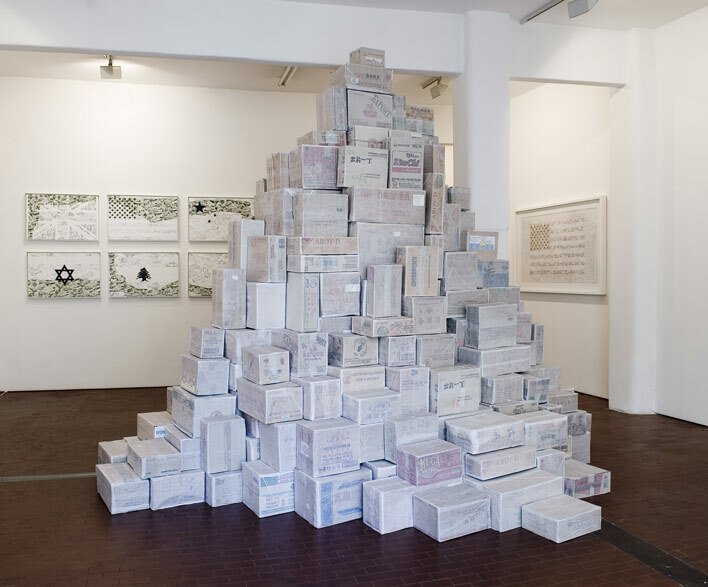 The sculpture is a pyramid of boxes and containers from China, which Ruffo collected from shops and other businesses on the bustling streets around the main railway station in Rome. A viewer can enter the pyramid, and in the cave-like centre watch a video representing the trials displaced refugees who cross borders through the mountains. This pyramid, built of blocks that represent the everyday power of commerce, seems to announce a new economic power, capable of building and creating nations, and enforcing their boundaries. In Pietro Ruffo’s work, the subject of flags and maps becomes an image of contemporary globalization, and seems to indicate that the physical and sociological evolution of territories doesn't often correspond to economic and political rules. Pietro Ruffo’s paintings, drawings and sculptural installations reflect his intense social and moral concerns. In 2005, he travelled to Beslan, the Ossetian town in Russia where Chechen and Ingush terrorists seized a school in an action that led to disastrous consequences. There, he worked with children who had survived the massacre. An exhibition last year at the Pino Casagrande gallery in Rome explored this destructive event in a paper room, and also depicted the local population's hope via large white paintings of the mountainous region. More recently, Ruffo has worked on a special project in the psychiatric hospital in Colmar near Basel in Switzerland, and a new canvas related to this is also included in the present exhibition.